This page is for BEMANI artist Daichi Watanabe, commonly known as PON. Not to be confused with the IOSYS' artist Daisuke Watanabe, or the jubeat copious APPEND license song PONPONPON. Daichi Watanabe debuted in BEMANI as part of the sound staff in pop'n music 16 PARTY♪, being in charge of creating charts for many songs, including most of the licensed songs. Since then, Daichi has composed songs for nearly every BEMANI series. Daichi's music style consists mainly of J-POP and instrumental songs under his Power of Nature alias, thought he has dabbled in techno and trance on the occasion. 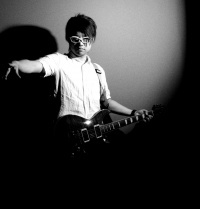 Daichi has also been credited as a sound designer in beatmania IIDX 16 EMPRESS and beatmania IIDX 17 SIRIUS, as well as a sound assistant in GuitarFreaks V5 & DrumMania V5 Rock to Infinity. Daichi became one of the sound directors of pop'n music beginning with pop'n music 20 fantasia. Since pop'n music Sunny Park, he has been the head sound director of the arcade pop'n music series. "PON" stands for "Power Of Nature". Daichi is the composer of all the pop'n music system' instrumental BGM since pop'n music 18 せんごく列伝. Daichi is never referred to by his real name in interviews, events, or promotions. Since 2010, he's also been referred to as PON in the credits/staff messages of all BEMANI games (aside from CD manuals). Since so many Daichi Watanabe songs feature guitars, only songs not composed by him that he provides guitars for are listed. プロレタリア狂騒歌 ギリギリメガネ団 pop'n music peace - - - - ✓ ? This page was last edited on 12 March 2019, at 21:27.